Wellbores drilled to extract oil and gas can be dramatically reinforced with a small amount of modified graphene nanoribbons added to a polymer and microwaved, according to Rice University researchers. 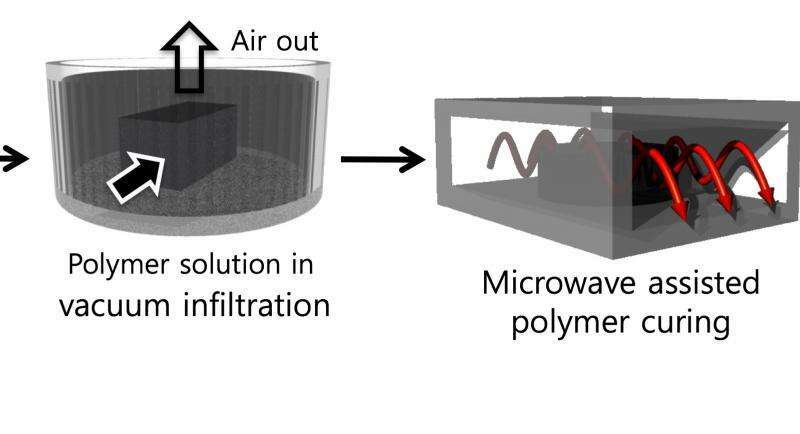 Results of their study appeared in the American Chemical Society journal ACS Applied Materials and Interfaces. In the lab, the nanoribbons were functionalized—or modified—with polypropylene oxide to aid their dispersal in the polymer. Mechanical tests on composite-reinforced sandstone showed the process increased its average strength from 5.8 to 13.3 megapascals, a 130 percent boost in this measurement of internal pressure, Shahsavari said. Similarly, the toughness of the composite increased by a factor of six.